Rick Bentham was born in Ontario, Canada in 1950. He studied fine art at the University of Western Ontario (Deans Honours List). He is also a graduate of film animation, Vancouver College of Art (class of 1977). Rick worked in Canada for a number of years. Rick received the Canada Council Award for a series of paintings based on Canadian Indian Mythology. He has exhibited in numerous well-known venues across the United States and Canada such as the St. Lawrence centre in Toronto and the New Artists presentations in Madison square gardens in New York, in 1982. He has simultaneously pursued a distinguished career in illustration and film animation. Rick has worked on 12 feature films as a background artist and visual development artist. Rick paints contemporary genre scenes in a "post impressionist" style. 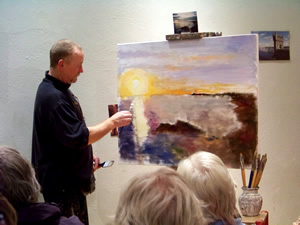 Living in Greystones, Co. Wicklow, Ireland, he is inspired by the beauty of the area. These paintings are immediate and sensitively painted in a traditionally realistic technique. Working in oils primarily, his technique is meticulous, building up broad spectrums of colour with multiple brush strokes. His work is dominated by nature. He is fascinated by the movement of water and its power to engage people, especially children in a multitude of activities. He is also inspired by the many light effects in nature. Foggy harbours, storm dark skies, magical glow of moonlight on snow, radiant light bursting from majestic clouds, the brilliant dazzle of sunshine on the sea and rivers gently winding turned to gold by the setting sun...the dance of light. He has had successful solo exhibitions in a number of galleries including Killarney Art Gallery, Kilcock Art Gallery, and the Frederick Gallery. © 2019, Rick Bentham. All Rights Reserved.